The Image Collections and Fieldwork Archives (ICFA) at Dumbarton Oaks is pleased to announce the online publication of our Oral History Initiative: http://www.doaks.org/icfa/oral-history-initiative. Each interview is represented with a page that includes a brief biographical sketch of the interviewee, a video of the interview, and corresponding transcripts (when available). All videos are available in full length, both on ICFA’s website and through Vimeo: http://vimeo.com/album/3138256. 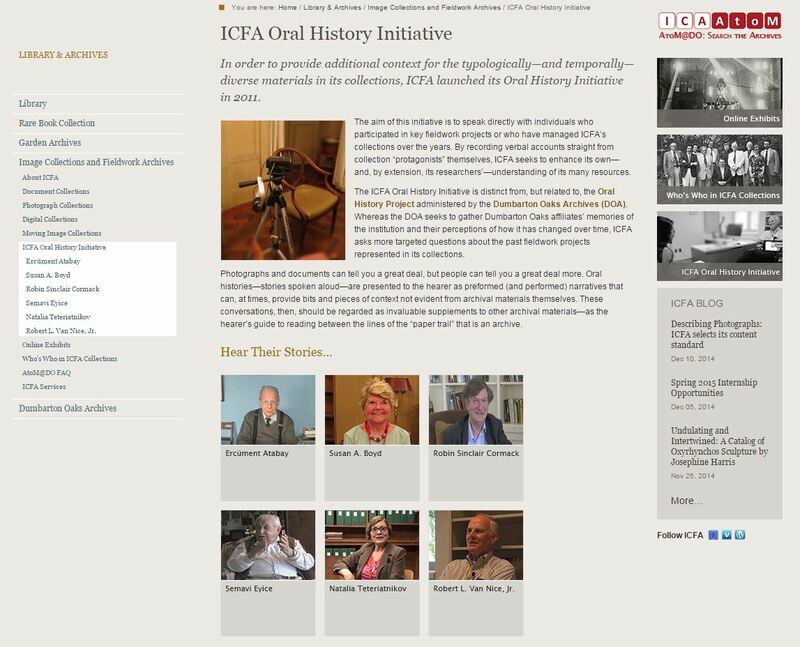 Sreenshot of ICFA”s Oral History Initiative web page. ICFA launched its Oral History Initiative in 2011, with the support of the Dumbarton Oaks Archives (DOA). Our aim was to speak directly with individuals related to ICFA’s holdings, whether they participated in fieldwork or research projects documented by our collections or managed the department’s diverse collections over the years. Our main goal is to gather information, such as first-hand descriptions of fieldwork or personal recollections of key individuals, that may not otherwise be captured in documents or photographs. This work is ongoing and the Oral History Initiative site will continue to grow as we conduct additional interviews and create new transcripts. The ICFA Oral History Initiative complements the Dumbarton Oaks Archives’ Oral History Project: http://www.doaks.org/library-archives/dumbarton-oaks-archives/oral-history-project. While DOA interviews focus on affiliates’ memories of Dumbarton Oaks and their perceptions of how it has changed over time, ICFA’s oral history interviews center on targeted questions about the people and fieldwork projects represented in ICFA’s collections. Together, these interviews provide a vivid portrait of the institution and the remarkable individuals who participated in its myriad activities over the past 75 years. 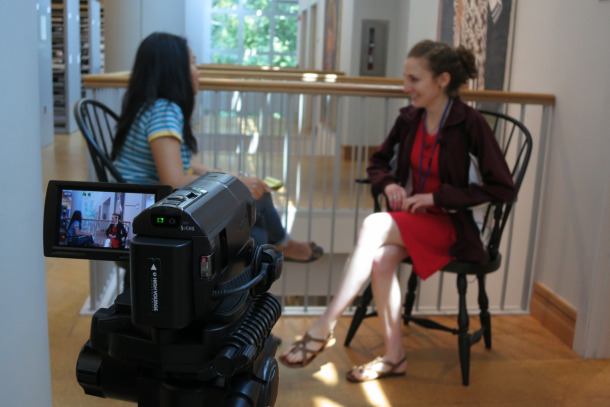 Caitlin Ballotta (right), ICFA Summer Intern 2014, prepares for an oral history interview. ICFA wishes to thank our wonderful colleagues for their collaboration, support, and feedback: James Carder, Lain Wilson, Deb Brown, Prathmesh Mengane, and Molly Marcusse. Very special thanks goes to Caitlin Ballotta, who creatively and meticulously planned and created the webpage for ICFA’s Oral History Initiative during her Summer 2014 internship in ICFA.